Hi! Co-pirate Kristin here. I’m a little behind Caroline in getting my posts in. As you saw in our introduction, we’re still holding down full-time jobs while trying to sail as much as we can. The weather on the Chesapeake has been exceptional for August–comparatively cool and dry–so we’ve been trying to get out as much as possible, and work, well, is work and sometimes kicks up a squall of its own. So lots of backed up posts that I hope to get up in the next week or so. And as you will see in the Events section, we are on vacation next week — sailing down the Chesapeake wherever the winds take us for 9 days, anchoring out and eating well. So more to come! Meanwhile, this was the main course during our raft up at St. Michaels when Caroline made her fabulous stuffed tomatoes. We’ll post the appetizer recipes and a tale of the weekend soon. Bon voyage, and bon appetit! You will need a nice cut of flank steak — we had 2.5 lbs for seven people and very few leftovers — garlic, ginger, soy sauce, olive oil, and black pepper. 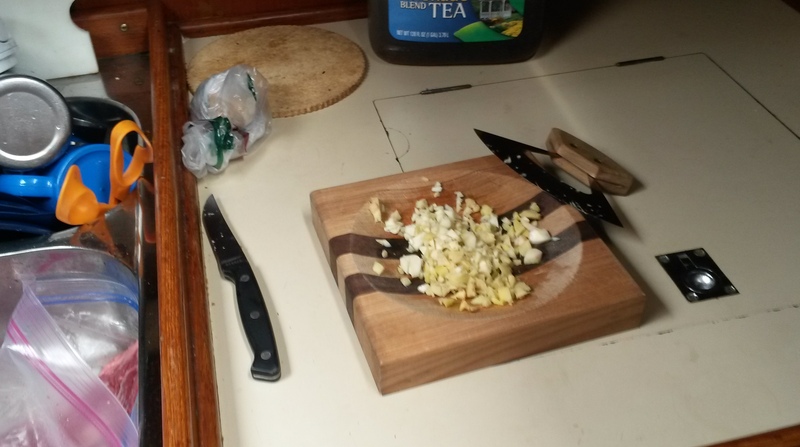 This “ulu” and rounded hardwood cutting bowl from Alaska Cutlery is one of my favorite galley tools for finely chopping aromatics. Quick and easy, uniform and combined, and you can leave midway to tack the sails and not worry about things rolling around or spilling. 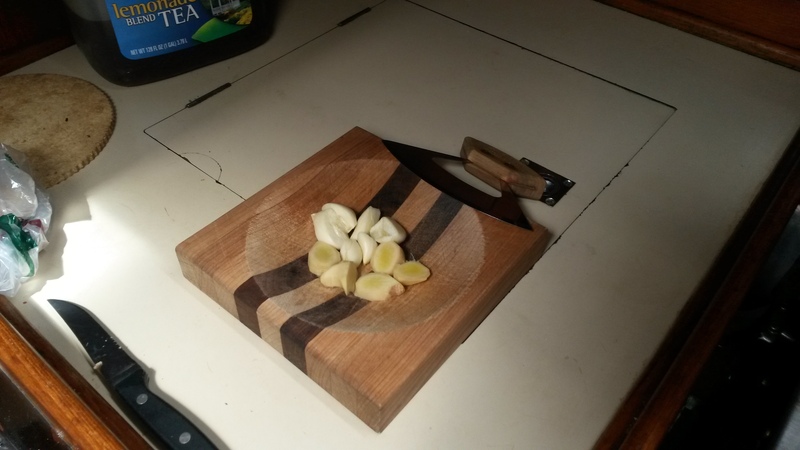 Finely chop about a cubic inch of both garlic and ginger for every 1 to 1.5 lbs of meat. There’s not a lot of precision here, as it’s just a marinade (longer marinating will intensify flavors with slightly less aromatics, though don’t go too long or meat will deteriorate). Put garlic, ginger, and about 1/2 cup of both olive oil and soy sauce per 1 to 1.5 lbs of meat in a large, heavy ziploc bag, together with a dash of black pepper and the meat. 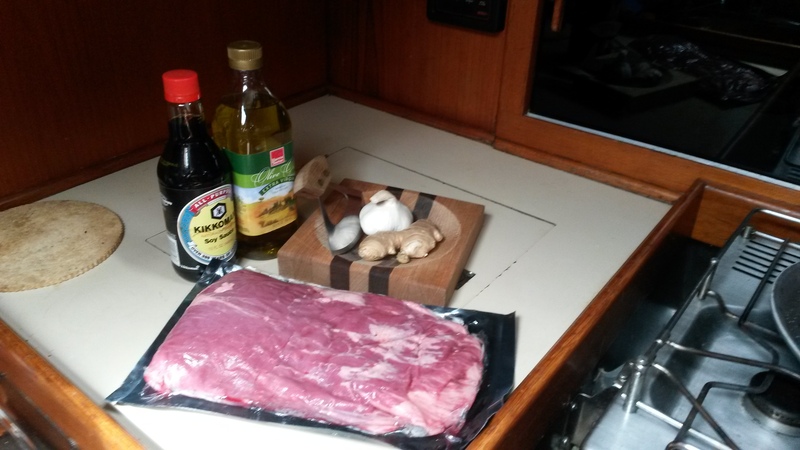 This is a marinating strategy that is great at home, but priceless on a boat — easily manageable and disposable, and if you’re not raw-meat-o-phobic you can throw things like vegetables (in this case, broccoli and cauliflower are wonderful) in the marinade afterwards and grill or saute them. 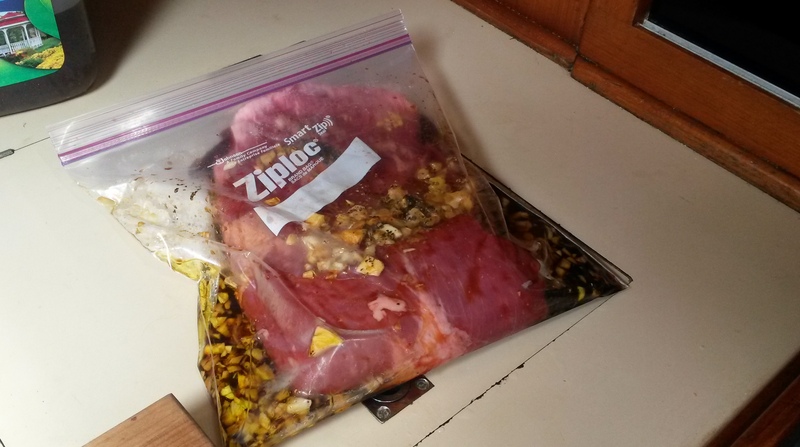 When recipes call for you to “turn” something that’s marinating — and you’re underway and heeled over — it’s much easier to grab a ziploc bubble, give it a turn and a squeeze and stuff it back in the icebox with the speed and agility required underway! 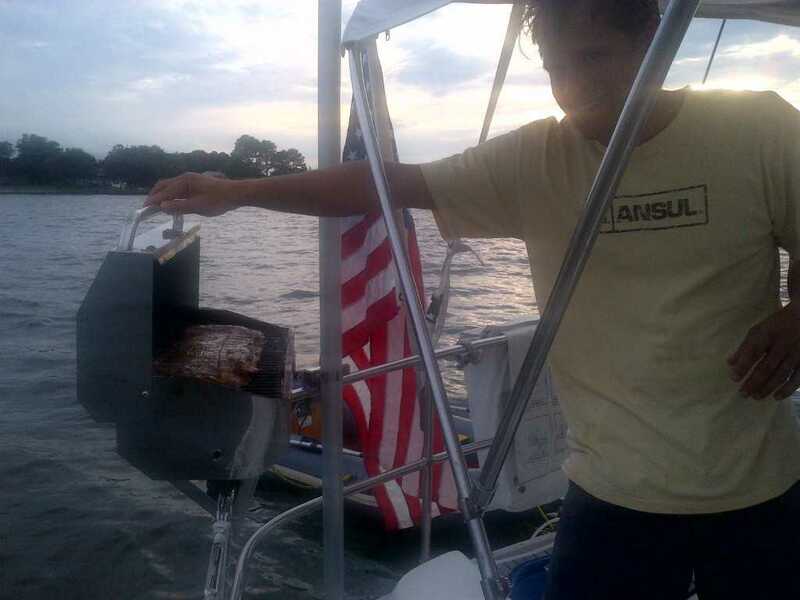 At this point, with the anchor set, but the camera dead and two appetizers to make, I passed the meat up to my captain and grill master to cook, with my brother’s Blackberry as the sole memorial of the event. 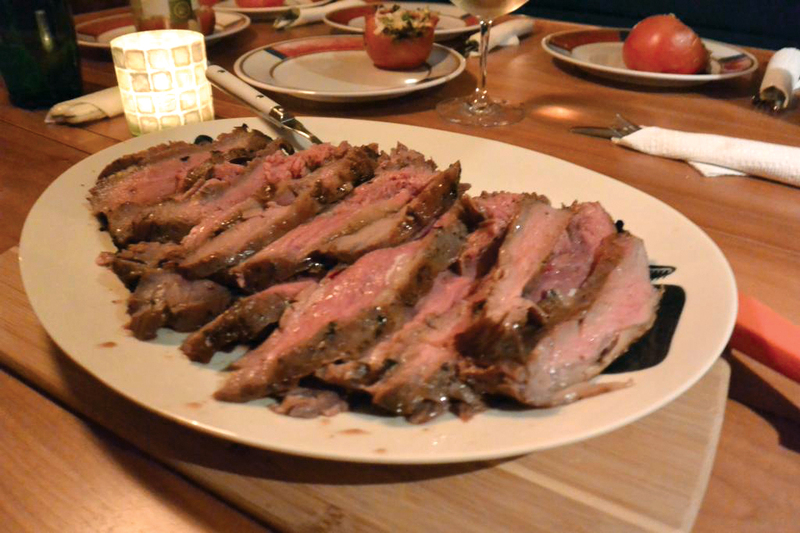 I’ll have Peter do a future post on grilling tips, with photos, but here are the main rules: know your grill, and put the thick end of the steak over the hottest portion (ours is closest to the fuel source, a small propane tank attached to one end of the grill); preheat the grill to a high temperature, then turn to medium heat and put the meat on to get a good sear; cook on one side, then the other until the char and firmness are just right. We’re not going to pretend we use a thermometer on board…here is a tip on firmness: using your hand as a comparable, meat is rare when it feels like the loose flesh between your index finger and thumb. If you nick it with a knife, the meat will still be red in the middle. This is when we like to remove it, as it will continue to cook for a few minutes after it is removed from the grill. After you let the meat rest for 5 or 10 minutes (minimum…no maximum to worry about other than it cooling…and it’s wonderful cold! ), slice it as thinly as you can across the grain. Encourage diners to taste before salting — the soy sauce adds a lot of saltiness. And finally, eat with your fingers…you’re at sea!